Are you getting everything you can from your GIS? How do you know? It might be time for a little introspection. Although this article focuses on GIS managers in the utilities industry, you can apply the thinking behind these questions to your organization no matter what you do. You will likely discover areas where you can expand the use of GIS throughout your organization and maximize its (and your) value. Seems everyone takes selfies these days with their smartphones, posting pictures of themselves on Facebook, Twitter, or other social media. This seems awfully self-indulgent. Yet maybe it's a good thing to take a hard look at yourself once in a while. Maybe taking a selfie gives you a chance to reinvent yourself. 1 Take a selfie of your GIS. Now's the time to ask yourself, is my GIS doing what I want it to? Is my GIS just a technology to computerize my old operating maps faster and make them neater? Here's a question for you: Are you still printing those old maps and mailing them to district offices? Maybe you create a PDF and email it instead. But if that's the case, are you at least also leveraging the latest technology, such as the cloud, imagery, smartphones, and tablets? Could your editing process be streamlined? Based on your answers, it might be time to change things—and fast. 2 Use GIS to solve business—not just mapping—problems. Most utilities still use GIS only in operations and perhaps for a few workflows like outage management or distribution design. But think about how many of your problems relate to location. What if you could find where workers are more likely to get hurt? Or imagine you could map Tweets of unhappy customers. Your GIS could even pull crime statistics from the police department's GIS and layer these on top of streetlight outages. That could help to prepare your field crews. 3 Stop thinking about GIS as an application; it's a platform. In the past, GIS was a client/server system, and it was hard to integrate it with other systems. But today, GIS talks easily to other business systems. It's a platform meant to be integrated. Business systems need location, and they get that today not by using clunky processes for extract, transfer, and load but rather by collaborating directly with the GIS. Modern GIS rethinks and simplifies the whole information technology architecture. GIS draws on fast, secure web services to leverage the wealth of data available from the web—whether the information was collected around the corner from you or around the world. 4 Stop building custom GIS applications. 5 Simplify your asset data model. Most data models are too complicated. One of my colleagues likes to describe this old-fashioned GIS as being like a blueberry muffin with too many blueberries—it's too heavy. Every time a utility builds a new application, more blueberries are added. The cleanest system has the least amount of blueberries, or attribute data, in the model. Don't duplicate data; it should exist in only one system. If you need the data in an application, reference it from somewhere else. Just because you want to display data in your GIS doesn't mean it has to be stored there. Remember this: simplicity scales; complexity fails. 6 Stop building your own basemaps. In the early days of digital mapping, utilities built their own basemaps with relevant streets, landmarks, parcels, and water bodies. But these old maps had no accurate coordinate system; they mostly predated GPS and will never be as accurate. There are many accurate basemaps Esri makes available online for free from Esri's Living Atlas of the World hosted on ArcGIS Online. Use them. Sure, you will have to adjust your asset information, but in the end having a more accurate coordinate system will save you lots of time and aggravation. Plus, you won't have to store, manage, or edit that data ever again. If you need to access data about a proposed street plan, find and store it in the GIS as a separate layer. Once it's in your basemap, you can place it anywhere. If your data stinks, so does your GIS. Despite knowing this, utilities still encounter bad data plaguing their industry. With incorrect, incomplete, or old data, GIS features and functions are useless. With all the effort you put into building a sophisticated data model, don't short sell it by populating it with bad data. 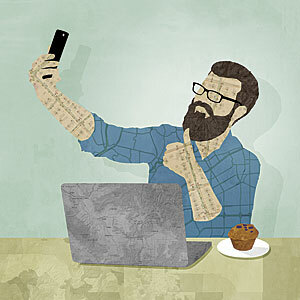 So take a selfie of your GIS, study it, and then take these steps to modernize your GIS. Bill Meehan is the director of Esri utility solutions and a registered professional engineer. Meehan is the author of Empowering Electric and Gas Utilities with GIS, Power System Analysis by Digital Computer, Modeling Electric Distribution with GIS, and GIS for Enhanced Electric Utility Performance, as well as numerous papers and articles, and has lectured extensively and taught courses at Northeastern University and the University of Massachusetts. Prior to joining Esri, Meehan was the vice president of Electric Operations at NSTAR, an electric and gas utility in Boston. He holds a bachelor's degree in electrical engineering from Northeastern University and a master's degree in electric power engineering from Rensselaer Polytechnic Institute.